Cover “2” Robber puts the safety aligning 3 to 4 yards between and behind the linebackers. First, check release of nearest receiver and mirror the quarterback. Second, drop straight back and help on inside routes. On all run plays work inside out as a safety valve. Defensive Strength: Rob inside receivers and horizontal and crossing routes. Defensive Weakness: Inside receiver away from robber, corner routes and soft force. Corners will disguise their coverage by showing Cover 3 and then bailing to Cover 2. Cover “3” Is a three deep zone with four underneath defenders. Cover “3” is excellent coverage vs outs and hitch routes. Linebackers: Drop to short middle zones. Eight to twelve yards deep on all drops with your head on a swivel looking for receivers coming into your zone. Pass off receivers to teammates on all tito’s. Make contact and work your eyes and your feet. Sam and Rover: Read release of nearest receiver, key number two dropping to short Hook and Flat routes, keep head on a swivel. Pass off receivers to teammates on all tito’s. Make contact and work your eyes and your feet. Corners: Cover deepest receiver in your zone, key number one your side. Keep outside 1/3 zone. Align six to eight yards deep on inside shade of the number one receiver. Never align any closer than eight yards from sideline. 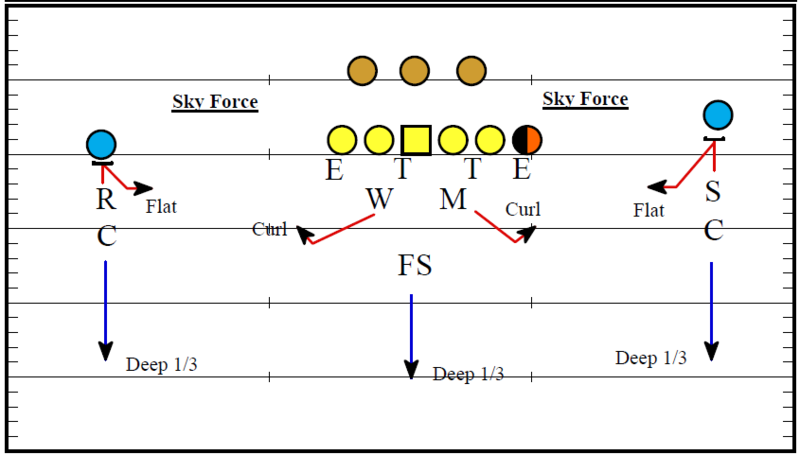 Defensive Strength: Outside force and contain is a strong point for cover 3. 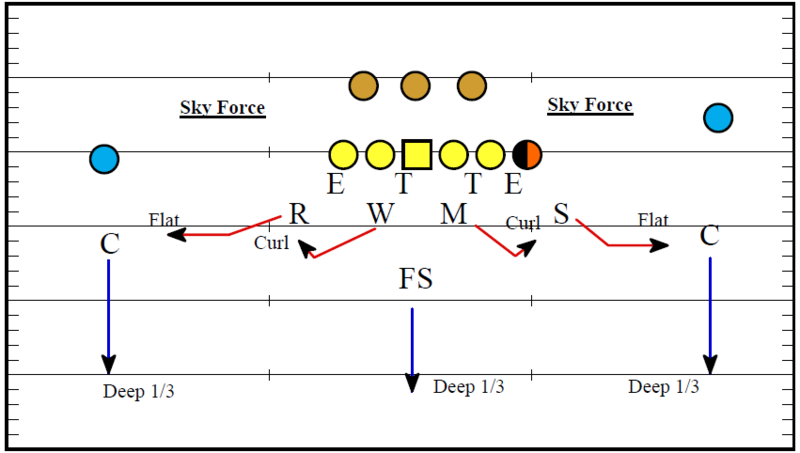 Another strength with the use of Cover 3 is to disguise other coverages that come off of a cover three look. Defensive Weakness: Crossing routes, Horizontal Seam routes and easy releases by receivers. 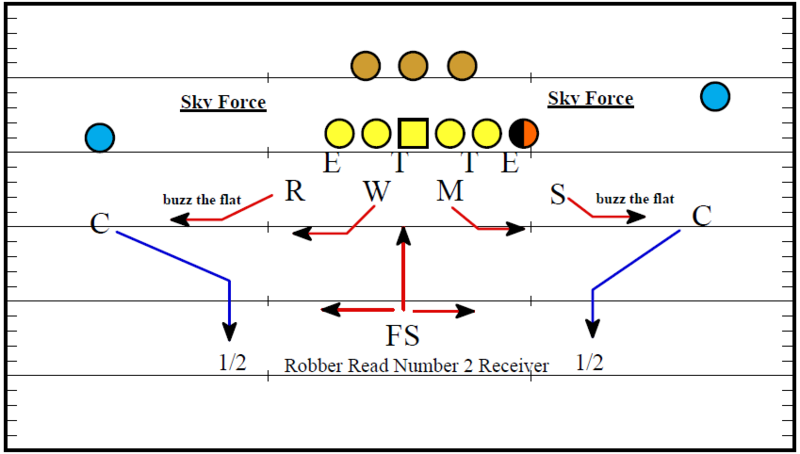 Cover “3 Green Combo” Is a three deep zone with Sam and Rover pressing the release of the number one receiver. 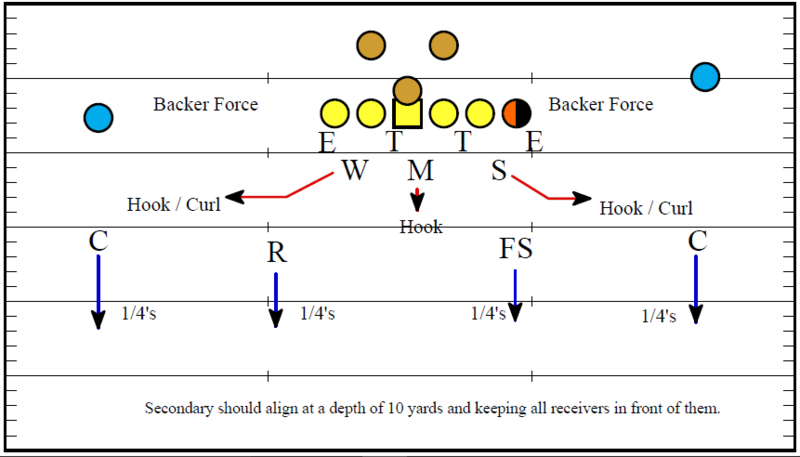 Linebackers: Drop to short middle zones. Eight to twelve yards deep on all drops with your head on a swivel looking for receivers coming into your zone. Sam and Rover: Read release of nearest receiver, key number two dropping to short Hook and Flat routes, keep head on a swivel. Cover “4” is known as Quarter’s coverage. Excellent coverage for defending 3rd and medium situations. Quarters coverage divides the deep zones into quarters with four defenders going into deep zone coverage. One major weakness in quarters coverage is that we have only three underneath defenders. Quarters coverage puts a big stretch to the underneath coverage. Linebackers: Best to run quarters coverage from 31 Wide. Both Sam and Will Backers have secondary contain with run towards them and collapse with run away. Defensive Strength: Good coverage to disguise additional coverages from. Good coverage when offenses need seven yards or more. Good prevent coverage, good vs four vertical receivers. Defensive Weakness: Can’t cover the Out routes, contain to the perimeter,and Horizontal seams.